B.A. 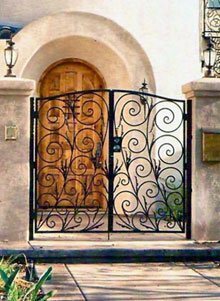 Ramirez & Sons Ornamental Iron Works, Inc. specializes in making custom iron fences, gates, railings, doors, and window guards. We have over 30 years of experience providing quality workmanship, outstanding service, and incredible value to Chula Vista customers, as well as thousands of satisfied clients throughout Southern California. We pride ourselves on helping customers get the best results for their budget, whether they need something for safety and security or wish to upgrade the look of their home or business. Our designs range from the simple to the highly ornate, and we can work with strict budgets as well as budgets that have no limits. And, for those that wish to repair their existing iron fence or gate in Chula Vista, we offer reliable and cost-effective iron fence repair and replacement services. Because B.A. Ramirez & Sons is a family-owned and operated business that depends on referrals and returning clients, we prioritize customer satisfaction at all times. Our knowledgeable and highly experienced craftsmen work closely with our Chula Vista clients throughout all stages of their commercial or residential projects. They will happily work off of photos or make recommendations to assist clients in choosing between our many iron fence, railing, door, window guard, and gate options. We offer solid and tubular iron, hand-forged and casted designs, protective treatments, and finishes in hundreds of colors. We can also install durable hardware, automated gate openers, and access control features. 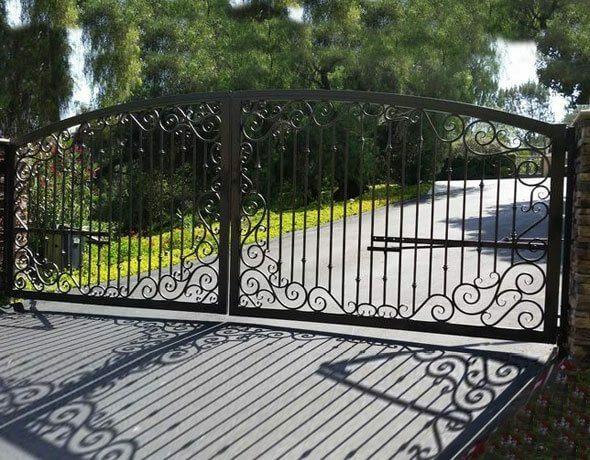 By consulting fully with our clients, we are able to give them a long-lasting, beautiful ornamental or wrought iron fence, gate, enclosure, door, or railing that complements the overall look and feel of their Chula Vista properties. Call B.A. 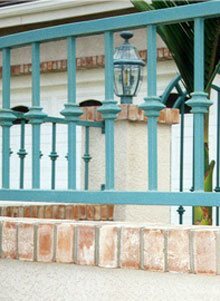 Ramirez & Sons Ornamental Iron Works, Inc. today to obtain a free quote for your new or replacement iron fence, entry door, enclosure, railing, window guard, and/or gate at your Chula Vista home or business. We are licensed, bonded, and insured, and all our iron work is fabricated and installed in strict compliance with city, county, and state building codes and safety standards. Moreover, we stand by all of our ironwork with a written warranty. When you choose B.A. Ramirez & Sons Ornamental Ironworks, Inc., you are are certain to be delighted by your new iron fence's craftsmanship, quality, and fair price. In business for more than 30 years, we have decades of experience building, installing, repairing, and replacing iron fences in Chula Vista and beyond. Our iron fence fabricators are all highly skilled craftsmen and can design all kinds of functional iron fences for Chula Vista customers, including wall-mounted fences, pool fences, front-yard fences, property line fences, privacy fences, and security fences. 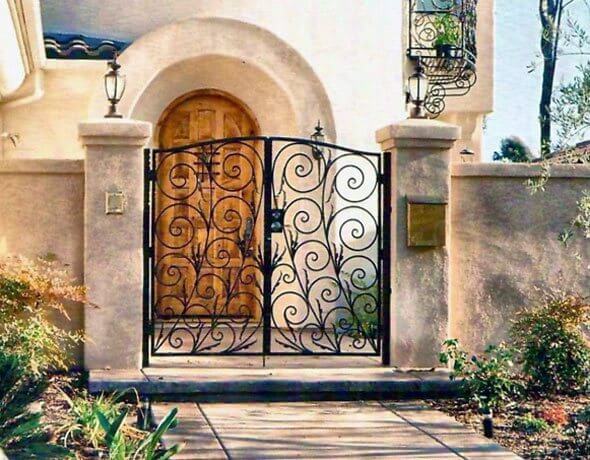 Because our employees have unsurpassed hand-forging and welding skills , they are further able to provide customers in Chula Vista with simple to highly ornate iron fences. Working with both solid and tubular iron, they can enhance your iron fence with hammered pickets, security-enhancing toppers (such as spikes and spears), scroll work, cast iron decorative elements, and attractive finishes. Call us today and we'll help you install a new iron fence for your Chula Vista home or business, or repair/replace your existing fence. 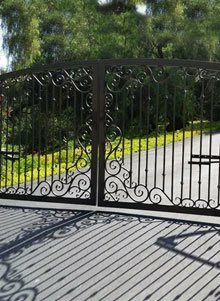 To complement our iron fencing services for Chula Vista, we design, craft, and install all kinds of iron gates, from the strictly functional to the highly decorative. 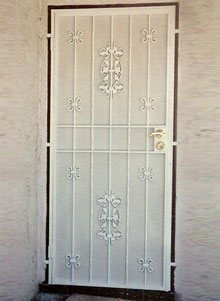 Our iron entry, security, and access gates are hand forged and welded, built from tube or solid steel, and usually protected by a metallized, galvanized, or powder coat finish. Our wide selection of finish colors ensures that your iron gate will perfectly complement your home or business's exterior. 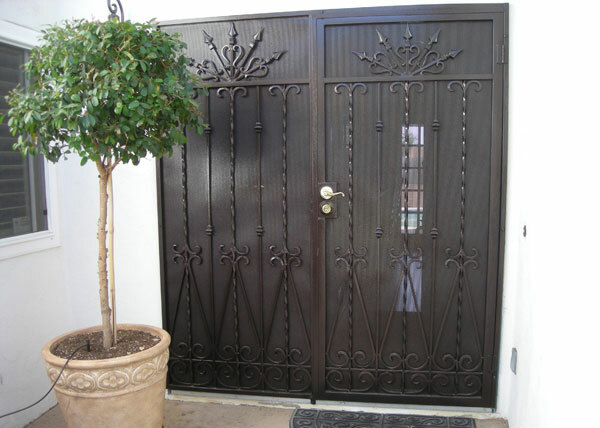 Plus, our iron gates in Chula Vista can be installed with any hardware, access control (card readers, intercoms, etc. ), or motorized operator system of your choosing. Contact us today to learn more and receive a free online estimate. With 35 years of experience, B.A. Ramirez & Sons knows how to provide its customers in Chula Vista with beautiful, lasting, and highly reliable automated gates. We start with an on-site consultation where we can take measurements, discuss what your functional needs are, and get a sense of what type of gate design will best complement your property. We then develop your gate's design by making appropriate recommendations and helping you make well-informed decisions based upon your long-term goals and budget. Each automated gate features our expert craftsmanship and high-quality materials. We then automate our gates using your choice of motor. In most cases, our Chula Vista customers choose automated gate systems from Elite, RamSet, DoorKing, LiftMaster, Linear, or All-O-Matic, but we are happy to work with any brand they prefer. With any automated gate system, we typically also install two safety devices that help to prevent entrapment and damage, and can add on any security access features, such as a keypad, telephone entry system, and more. Call today to arrange your free on-site consultation. 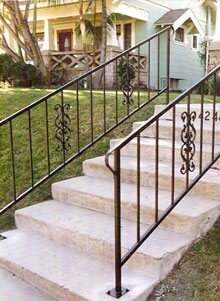 If you need a beautifully decorative or strictly functional iron railing for your Chula Vista home or business, contact B.A. Ramirez & Sons Ornamental Ironworks, Inc.. Customer satisfaction is extremely important to us. 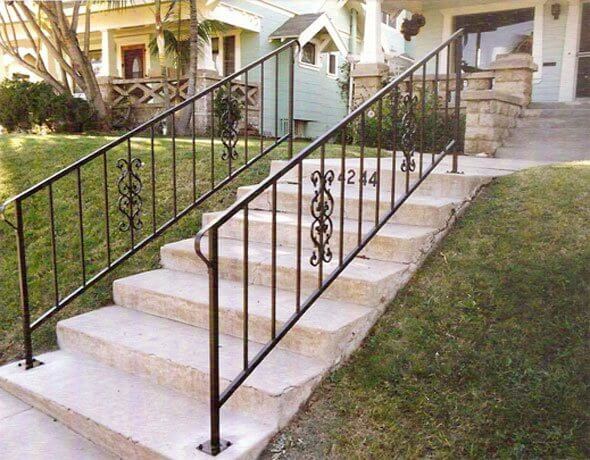 That's why, from project conception to completion, our skilled, experienced iron work professionals will work closely with you to design, craft, and install the perfect iron railing for your Chula Vista home or business needs. We have experience building thousands of iron railings, including guardrails, balcony and staircase railings, and ADA-compliant handrails. Our prices are fair and we stand by all our work with written guarantees. At B.A. 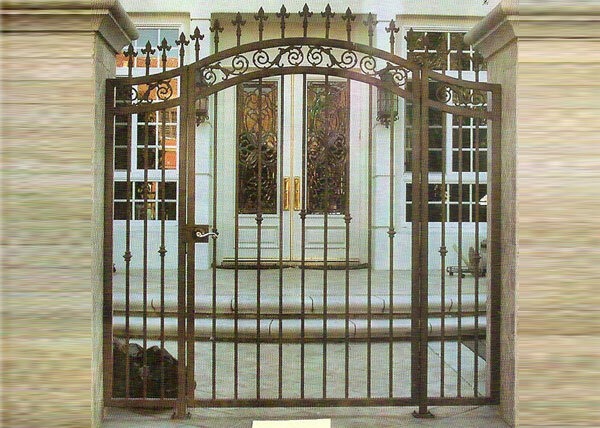 Ramirez & Sons Ornamental Ironworks, Inc., we are experts at designing and fabricating iron screen doors. We install our interior and security screen doors to fit perfectly to door openings of any size or shape, and can also construct exterior doors away from your front door in any style you prefer. No matter your preference, we always offer lasting craftsmanship and back our sturdy steel frame construction with a two-year warranty on both labor and materials. To give you the level of security you wish to achieve, we can install a telephone entry system that lets property owners control visitor access via a smartphone or landline. 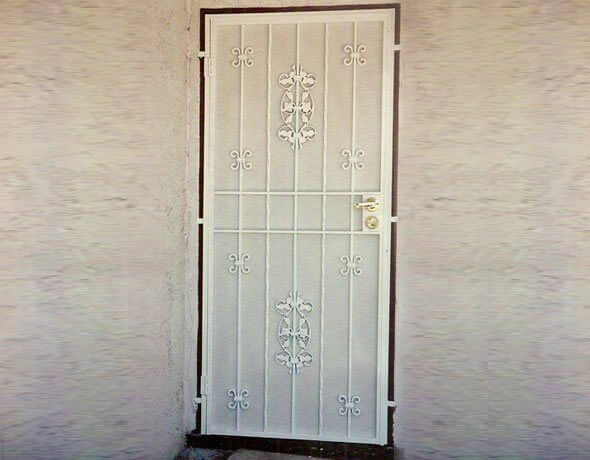 Call today and tell us about your upcoming plans for an iron entry door or other iron security door in Chula Vista. B.A. Ramirez & Sons Ornamental Ironworks, Inc. also specializes in installing iron security window guards for Chula Vista customers looking to protect their residential or commercial property from unwanted intruders. Our iron window guards can feature a simple structure (such as straight iron bars and spiked spear tops) or a highly ornate design (such as custom scrollwork, integrated castings, and smooth or hammered finishes). Call us today to find out about the attractive, competitively priced iron security window guards we install in Chula Vista. At B.A. 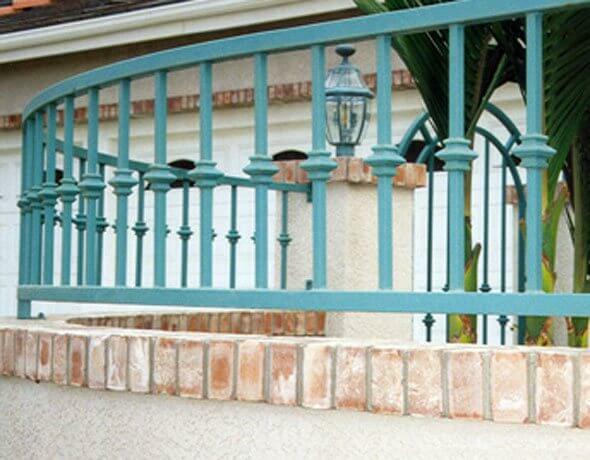 Ramirez & Sons Ornamental Ironworks, Inc., we have provided Chula Vista homeowners and gated residential communities with superior quality iron fences, gates, railings, guardrails, handrails, doors, and window bars since 1980. Our residential iron work is designed to support a number of security, privacy, and safety needs while also adding an elegant look to Chula Vista interiors and exteriors. Our attractive and durable iron fences are perfect for enclosing yards, gardens, pastures, pet areas, and pool enclosures in Chula Vista and can be fitted with privacy-enhancing metal backings or wood panels. These fences can clearly delineate the perimeter of residential lots or discourage unwanted visitors from entering your property. Additionally, we complement your fence with matching entry or driveway gates and coordinate it with iron doors, window bars, and staircase/balcony railings. To learn more about our residential ironwork for Chula Vista, give us a call. Iron is the optimal choice to use for the fences, gates, railings, window guards, and security doors in your Chula Vista commercial building. Whether you need an iron fence to enclose your property's perimeter or divide areas of your property, our iron fences can be completely customized to your needs. If you are looking to elevate the look of your storefront or wine cellar, we can design and install gorgeous iron gates or doors. If you are looking to improve security, we can install automated gates with state-of-the-art access control systems and spear-topped perimeter fencing. And, if you are renovating, we'll help you meet current building standards by installing code-compliant staircase railing, balcony guardrails, handicap railings, and/or window guards with fire-release mechanisms. We use only quality hardware and gate operator/access control systems (such as those from Ram Set, DoorKing, and LiftMaster), but can install any equipment of your choice. Learn more about our commercial ironwork for Chula Vista by speaking with our professionals today. Thank you for the excellent work, our gate looks fantastic. We also appreciate the excellent customer service you and your staff provide. We look forward to recommending your company to friends and colleagues in the future. R10 B.A. 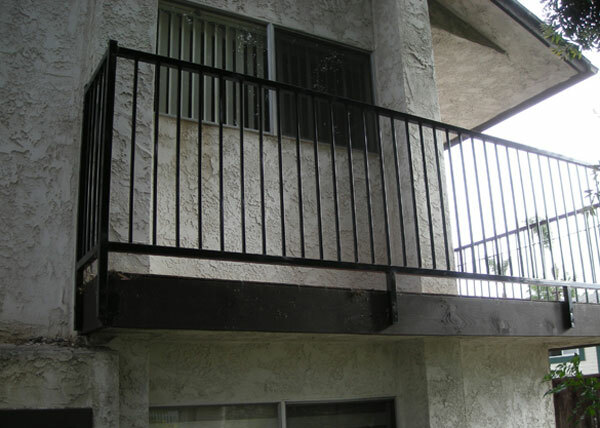 Ramirez & Sons completed this iron railing replacement in Chula Vista, CA. Old wood rails were replaced with this made to code standard iron railing. D9 B.A. Ramirez and Sons installed a security screen entry door in Chula Vista, CA. This double entry screen door includes twisted steel pickets, hand forged scrolls, and a perforated metal screen to keep the bugs out. G1 The "fleur de lis" spears above the decorative scrolls of this custom residential gate installation in Chula Vista, CA enhance the French style of this beautiful steel gate.